I remember photos and negatives of sun-scorched Nepal scattered around the floor, notebooks written in randomly and seeming empty, and the evening lights of the outside night that seemed like they wouldn’t ever darken. We drove to Santa Ana over the 405 freeway to record the cars going by, but ended up watching the lights, buying whisky, and sitting the car listening to scratched Joanna Newsom CDRs and Eno’s Discreet Music. When the night was finally asleep and quiet, everything seemed still and the streets seemed dead, except for the swaying palm trees, and the glow from the kitchen light that was never turned off. Even the things that don’t exist anymore are still there, even if they aren’t apparent and obvious as much as they once were”. Danielle Baquet-Long & William Thomas Long teilten nicht nur die Liebe zur Kunst/ Tonkunst, sondern auch die des Reisens, die sie nach Nepal führte, woher die Inspiration zu “Rags Of Contentment” stammt, das soundtechnisch den buddhistischen Gebetsmühlen ähnelt, wodurch Tibeter wie Nepalesen auf dem Pfad der Erleuchtung Unterstützung erlangen. 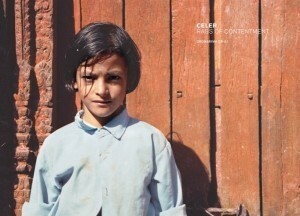 Though Celer’s Rags of Contentment is Dronarivm’s inaugural release (in an edition of 222 copies), it was previously issued on cassette in 2010 on Digitalis Limited. There’s no indication of the material’s actual recording date, however, though it appears to be one the group produced when Danielle Baquet-Long was alive (and therefore earlier than July 8, 2009), as she is credited with not only the Nepal-based photography but music production, too—Will Long also, of course, credited with the latter. Regardless, the material is classic Celer and receives an attractive presentation in the form of a large, trifold card cover (designed by Rutger Zuydervelt aka Machinefabriek), which one presumes will be the Dronarivm norm. Both of the recording’s deep ambient-drones are in the thirty-six-minute vicinity. Quintessential Celer, “Pleased to Be in a State of Sour Resplendency” unfolds as a series of long-form, softly glimmering tones whose becalmed, unruffled demeanour suggests twilight. Autumnal in character and soothing in effect, the material hovers in place, gently wafting on the slightest of warm, nocturnal breezes as its pulsating timbres ever-so-subtly mutate. One could just as easily imagine the material as the audio accompaniment to a gallery installation, with the piece’s thirty-six minutes repeatedly looped to accommodate the site’s hours-long visiting time. Without dramatically altering the overall style, the recording’s second setting, “Things Gone and Still Here,” darkens the opener’s mood by covering it with a dark, translucent veil and having its shimmering organ-like tones ebb and flow in even more subdued manner. No doubt listeners with an affinity for Celer in immersive dream-state—sleep-state, if you prefer—mode will find much to appreciate about Rags of Contentment.